Zade and L'Call, two armored men from the future, discuss their mission. It seems a being known as the Annihilator brings about Earth's destruction in the future so they are going to execute him in the present. Elsewhere Superman and his son find the Geneticron building while discussing Superman's decision to where his current uniform. In Metropolis Lois interviews Lex Luthor and is shocked to discover that Lex has a Mother Box. Suddenly Zade and L'Call attack the building leading Clark to summon Superman and Lex to don his armor. Superman arrives and battles Zade while L'Call, the Godslayer, prepares to kill Lex. It seems that in the future Lex takes Darkseid's place and for the sake of his victims-to-be Godslayer sentences him to death. Story - 5: There was a lot to like about this issue but I wanted to start out by focusing on the conversation between Jonathan and Superman at the beginning of the issue. One of the major sticking points for a segment of Superman fandom at the start of the New 52 and to a lesser extent Rebirth was how they changed Superman's costume. While some people embraced the new costume, there was that contingent of fandom that wanted DC to reinstate the traditional look. For those wanting the change the most common refrain was how he "wore his underwear on the outside". The fact that some of these people thought they were so clever in saying this didn't help the situation. So, I wanted to thank Dan Jurgens for taking a panel or two to discuss why that look wasn't terrible and to try to put to bed the idea that Superman wore his tighty reddies on the outside. It won't change the minds of the people that didn't like that look but it made me smile. After three storylines of setting up the new paradigm Jurgens finally settles in to a straight-ahead action story that doesn't revisit the past. In fact, this issue dives head long into the future and ties into the more recent JUSTICE LEAGUE story that closed out that title. The bearded guy from the past few issues has a name and a purpose and because Jurgens teased it out perfectly the reveal had a lot more weight. Godslayer and Zade felt a bit nineties but not in a bad way and their purpose makes them interesting as antagonists. The reveal of the Mother Box to Lois was another nice touch and I like that despite having so many call backs to the past the more recent version of Lex is getting some attention as well. Overall this was another great issue. The action and character were mixed perfectly, I liked the villains and there's enough bubbling under the surface to make you want to come back to see how everything plays out. I still don't trust the new Clark Kent and I look forward to seeing how that storyline is resolved. More than anything Jurgens continues to make this one of my favorite current books from DC. Art - 5: Tyler Kirkham got to play in a lot of sandboxes this time out. He effortlessly draws apocalyptic cityscapes, jungle scenes, armored antagonists and fun action scenes and never misses a beat. 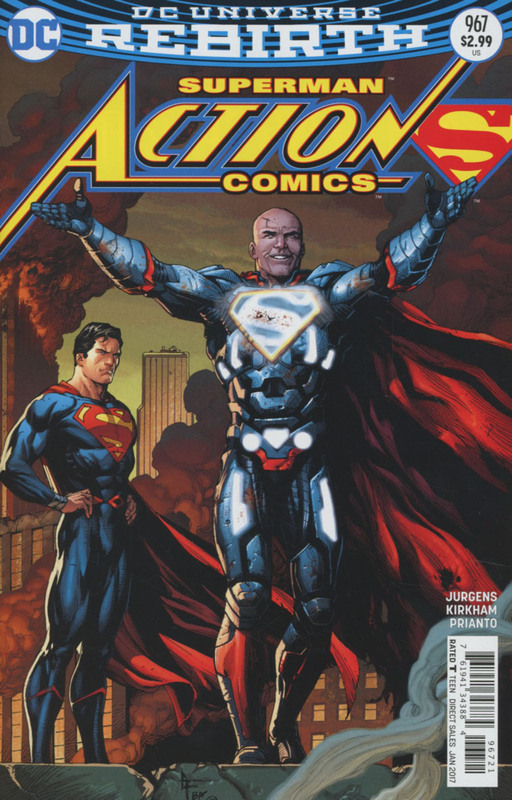 I particularly liked his Lex Luthor. He seems to have a knack for drawing Lex to look both evil and heroic depending on the outfit. The one page splash of Lex going into battle in full costume was fantastic and that final page of the Darkseid-esque Lex was great as well. The art, like the writing, has been consistently good and with a rotating artistic team that is quite a feat. Cover Art - 5: Duel shirt rips. This is my kind of cover. It helps that the art is strong and clean with some fun details, like Clark's buttons flying off the shirt. 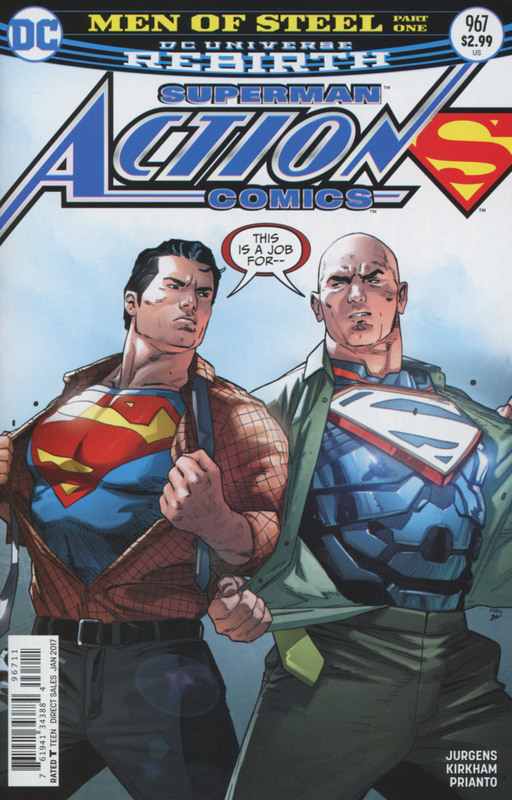 I do wonder how Lex hides armor under his clothes but I am also willing to let that one go. Variant Cover Art - 5: This is a fun variant. I love the expression on Lex's face as he obviously plays to a cheering crowd and the almost annoyed look on Superman's face. He's obviously not happy about how Lex is acting and it shows with his expression and his body language. This is one of those rare issues where the main cover and the variant are tied with me in terms of how much I like them.